Our Holsteins actually where ok to be around the young ones where a little wild. But the biggest problem was that the calves where really big and the cows got into alot of trouble calving. Not to mention that there is no money in milk now in the usa. There’s a lot of foreign trade pressure now to do away with the system, which I believe would be sad, as it’s the only part of the farm economy that is stable, never in crisis. I hope you save your system. I can’t say how important it is the USA factory farming is nasty. David my issues revolve around how the animals are handled in the massive dairy farms with 10,000 cows. Watch the dirty jobs where Mike Roe milks cows and if you have ever worked on a small farm it will turn your stomach and you won’t drink milk from the USA. As far as distribution I dont think it is at all an issue in Canada. The USA wants to ship our milk up into your market to flood it with our cheaper milk. We milked about 120 cows here back in the day. I have seen farms milking 300 with a system which was just as good at handling the cows. I don’t know where the line is because I haven’t see the farms in the middle but those mega farms with thousands of cows nope that really didn’t sit well with me. Agreed. Animal welfare matters to me. I think there is a line that once crossed causes major problems. If I lived there I think I would have to search out the best option for me and mine carefully. I was on vacation so chose a conventional milk from a dairy one state over. As to flooding markets that is an interesting distinction I think of supply management. Our system is not geared for export. There are some but very little. There are Large farms but the average is anywhere from 50-300. My grandmother had a cream quota in the early 70’s, and about 30 head. The cows came on time twice a day from the pasture to be milked, almost to the minute, and they all knew which stall was theirs, though a few would get scolded for trying another stall. It was quite a sight to see. People don’t realize that cattle have personalities and intelligence not much different from dogs. 30 milk cows daily produce at least 180 - 200 gallons of milk. Think of the store value of that. Yet in our world, that’s a quaint historical anecdote. I don’t want to sign up for a world where a few pennies extra profit per quart of milk leaves intelligent and playful animals cheated of the care and environment they should properly have, or at the expense of driving the farmers and their children away from the land and communities they love. In Canada there is a lot of talk about “cultural genocide”. True small farmers have seen their way of life and their communities annihilated over the last 40 years, with no remorse or consideration from larger society, all for corporate profits, when those people fed us, cared for the land and water, and were the heart of our culture. If anyone has suffered a wholesale cultural genocide, its been farming families, and farming communities. My hat is off to Dan, for fighting against the current, trying to do it right. Interesting topic fellas. When I was young in Florida, we worked on the dairies replacing all the wooden barns, fences, parlors, washers etc with steel. I was always amazed at how hard those Cuban farm keeper familes worked…20 hrs a day rotating through hundreds, maybe thousands of cows almost without stopping. It was always interesting to me how often the milkers fell off the udders and into the slop and how long they pumped pure cow crap before a worker got around to put it back on. But what amazes me more today, is how dairymen can stay in business with milk costing $.96 USD a gallon.I wonder how they make it. It’s a heavy, perishable product. How can you ship such a product around and actually make it worth producing? Billy I am always shocked when you mention the cost of stuff. I bought a gallon of milk yesterday at the grocery store the cheapest you can around it it cost $2.69 it is hard to believe I pay almost 3 times what you pay for the same gallon of milk. As to your question can you ship milk? Yes they ship milk hundreds of miles. When you buy it at the store it has what 2 weeks of shelf life? You can drive from Florida to Maine in what 12 or 15 hours? Shipping milk in refrigerated trucks is done all the time over vast distances that is why it can be so cheap they have to ship the milk from those massive dairy farms a very long ways. There are farms that have 10,000 cows each cow making 10 gallons a day that’s 100,000 gallons a day a quick Google search shows that the avg American drinks 20 gallons of milk a year. So those farms are shipping that milk a very long way even when you consider all the other milk products 10,000 cows will support the needs of alot of people. and that far off town of Springville AL. Many years ago I was the Springville police and knew everyone in town and their kin . I would have missed someone if they were out of town all day . It’s fire season. We are about at half light today, from fires in the Rocky mountains. Further west is much worse. 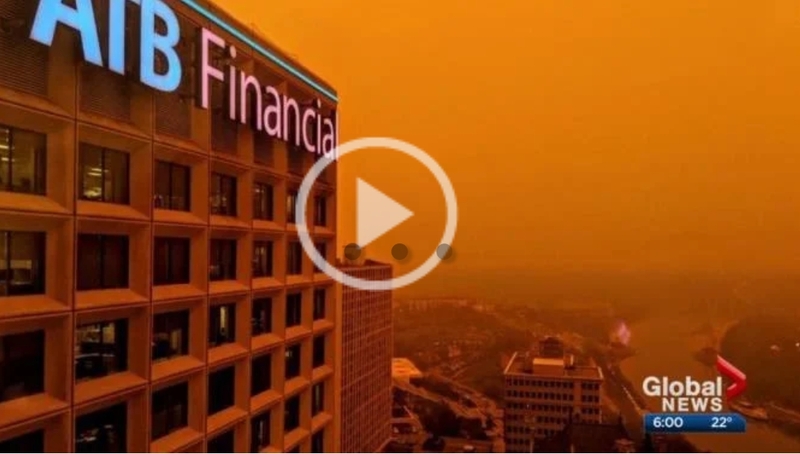 I’ve never seen anything as bad as this from fires so distant, or on this scale. 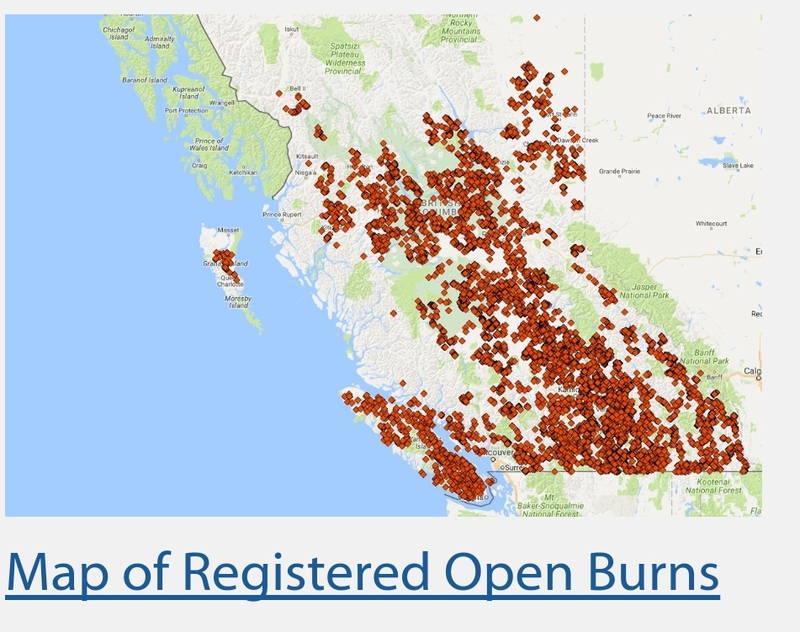 The first shot is a fires map for the province of British Columbia. Close to 600 so far. 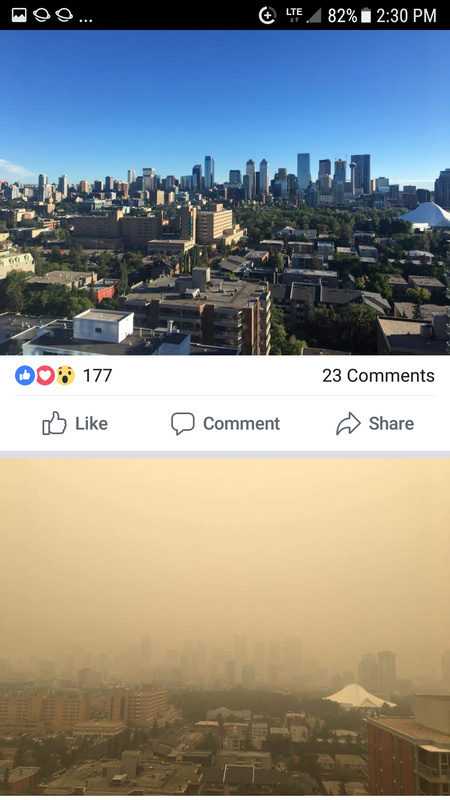 The second is a view in the city of Edmonton. This morning we have smoke about half as thick as that, no sun, at a distance of 1,500km. I just heard they expect the smoke will reach Europe in a few days. The second one actually looks like a normal day in some of the Asian cities. Wow…even though we received EU’s biggest rescue operation ever this summer, I now realise we had only small campfires compared to yours. Still winter here in Australia and we have nearly 90 Bushfires raging out of control in new south wales ,they say its going to be a bad summer coming . I would like to send our rain to you all, I don’t think we’ve had 3 days in a row with out it all summer. Raining now, calling for it all week end. Sign me up for at least an inch! We have not had more than a few drops here in the valley since the middle of June. Things are looking rather dry. And @taitgarry00 that smoke looks terrible. The last week here has been hazy, but the smoke is at a high altitude, so at least you dont have to breathe it. I have noticed a drop in output on my solar powered pump from the diffused light. Extremely dry here. Check out the color of the grass in the photo of a fence-busting red bull my neighbor just moved to the pasture next to mine.